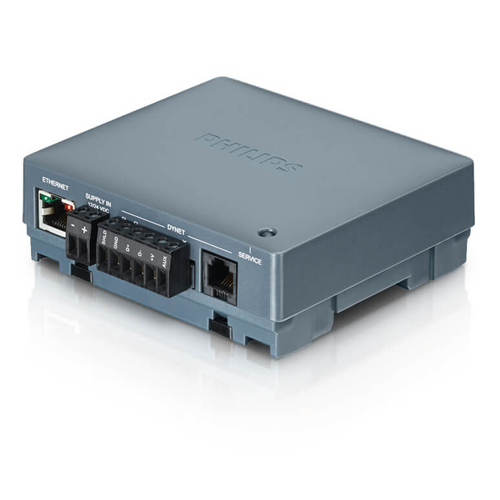 The Philips Dynalite PDEB provides a cost-effective Ethernet connection to a Philips lighting control system. The Philips Dynalite PDEB provides a cost-effective Ethernet connection to a Philips lighting control system. It provides bridging functionality between an Ethernet backbone and the DyNet fieldbus devices. The PDEB enables the implementation of a trunk and spur topology on large project sites, with the bridge providing a high-speed backbone coupled to many lower speed spurs. 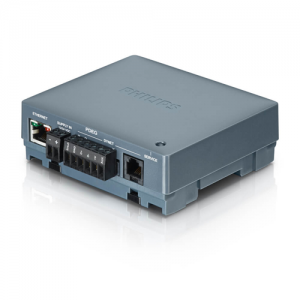 Cost-effective – The device provides an economical way to connect the RS-485 DyNet network to an Ethernet network. Internal controls – Programmable logic controller capable of comprehensive conditional and sequential logic and arithmetic function processing, packet filtering and DyNet to DyNet 2 translation. Flexible mounting solution – DIN-rail mountable, designed to be installed into a distribution board or other electrical enclosure.